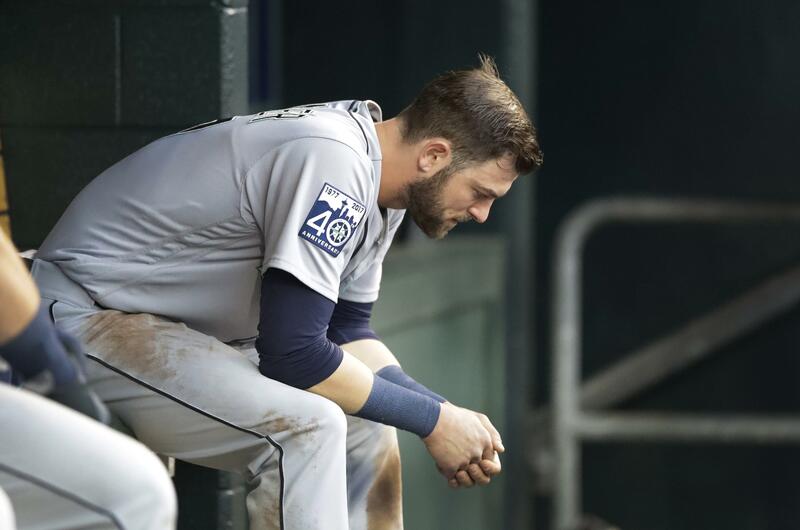 The Seattle Mariners on Wednesday made a host of moves in the aftermath of an embarrassing and painful – physically and emotionally – 19-9 loss to the Detroit Tigers on Tuesday. Starter Felix Hernandez, who left the game after two innings with a “dead arm,” later identified as right shoulder inflammation, was placed on the 10-day disabled list, as was OF Mitch Haniger, who was lifted with a right strained oblique. Neither player has a solid timetable on their return at this point. In addition, relievers Chris Heston and Evan Marshall, who were roughed up for five and seven earned runs respectively on Tuesday, were both sent out to AAA Tacoma. In their places: RHP Chase De Jong, LHP Dillon Overton, RHP Casey Fien and OF Ben Gamel, all of whom will be in uniform for Wednesday’s 4:05 p.m.clash against the Tigers. Also of note: Taylor Motter is in Wednesday’s lineup at 3B, meaning Kyle Seager will miss his fourth straight start with a hip injury/soreness. Game 22: Seattle Mariners (8-13) vs. Detroit Tigers (11-8), 4:05 p.m. In his last four appearances (5 2/3 innings), Nick Vincent has retired 17 of the last 18 batters he has faced, including eight via strikeout. During that span, he has also stranded all five of his inherited runners. Left-handed relievers Marc Rzepczynski (5 2/3 innings) and James Pazos (four innings) each have an active scoreless inning streak of at least four innings. The Mariners currently lead the American League with 39 doubles (sixth in MLB) and 18 stolen bases (fourth in MLB), while also ranking second with 95 RBI (DET-99), tied for second in walks with 81 (MIN-91), second in runs scored with 99 (DET-103) and third in extra-base hits with 63 (DET-65; TB-64). Over the last nine games (4-5), the Mariners are batting .311 (28 for 90) with seven doubles, one triple, four home runs, 43 RBI and 20 walks with RISP. They hit .157 (17 for 108) with two doubles, two home runs, 31 RBI and 15 walks with RISP over the first 12 games. In 1989, Ken Griffey Jr. leads the Mariners to a come-from-behind win over the Toronto Blue Jays, 7-6, with his first career four-hit performance. Griffey goes 4 for 4 with three RBI including a game-winning home run with two out in the seventh inning off Jays’ reliever David Wells. In 1990, This may or may not have been Griffey’s best catch, but it was probably the one that made it clear what a special talent he was in center field. On a drive by Jesse Barfield headed over the fence at Yankee Stadium, Griffey made a leaping grab that still is shown in the highlights. Published: April 26, 2017, 12:44 p.m. Updated: April 26, 2017, 3:46 p.m.